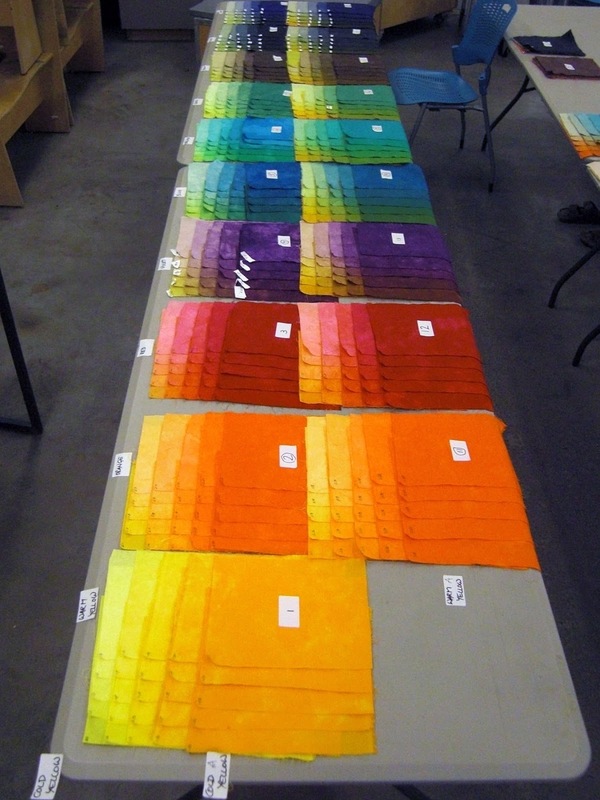 At the Quilt Surface Design Symposium in Columbus Ohio, one group of students are working together under the tutelage of master dyer and art quilter Heide Stoll Weber to create hundreds of dyed swatches. This exacting and laborious process results in mixes of complementary colors and runs from light to dark. I took this photo as Heide was laying out the groups, preparing to cut them. 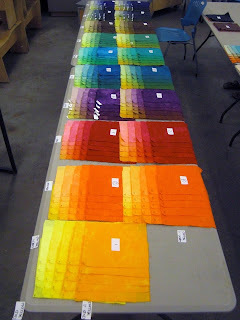 Each student will end up with a set of swatches that can go in a notebook, an invaluable tool for future dye sessions. By the time you read this, all the swatches will have been finished and everyone will be happily dyeing fabric, T shirts, whatever they please. The rest of us can only covet those swatch books.